This is actually a post and project I had not planned to do or to write! I was so happily surprised though with the results I decided to share it with you. What is the saying “Necessity is the Mother of Invention”? Well, I don’t know if that is the case or if we are just lucky or so Blessed that we learn to “make the best” out of what we have. I just recently experienced this. What a happy surprise! My Wednesday morning’s “Women’s Power of Prayer” group was held at my house this past week, because our wonderful leader had an opportunity to have a vacation with her husband and their children. It was not an overwhelming undertaking for me. I love to bake! I always have coffee and Tea @ the ready for all friends and family that pop by in the early hours of the day! So, how happy was I to have this wonderful group of women meeting here this time…It pleased me very much. One of the things that our leader has always had available at all of our meetings has been a prayer request box. One with blank cards to be written on & deposited in, (if someone preferred prayer that they weren't comfortable enough to request from the group). As well as, any donations, for some of the special reading materials available. (This has always been something that people could deposit anonymously, as not to provide any undo discomfort. And even though, our leader provided me with everything I would need for our meeting and what sections of our study to focus on. She had, in fact, forgotten this wonderful little (but very important box). I thought this was not a problem. Surely, I should be able to find something I could use. In fact, it wasn't as easy as I thought, to find something visually appealing, as well as, functional. So I searched my house the night before the group was to meet and stumbled upon this stationary, that someone had given me years before that was never really to my taste, but the hinged box was perfect for my needs. 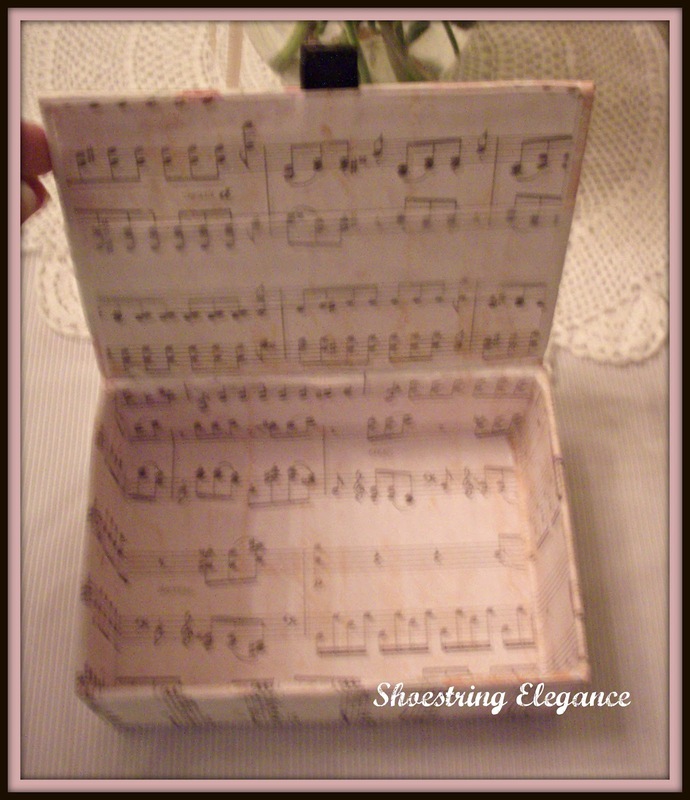 Then there was just the little matter that it was really not as delicate and pretty as I would have liked this important box to be. So I looked in through my craft supplies and had a couple of sheets of “card stock” scrap-booking paper, that I had saved for whatever.?! Okay, I was just taken with the look of it and thought when I bought it at .59 cents a sheet that it would be beautiful for something! And it was! 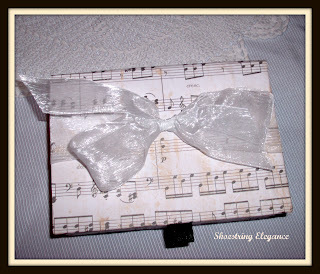 I got out my ruler, straight edge and tacky glue and covered, lined and wrapped the lid up with a bow!! Standing back at 12:30 am, I was quite pleased with my little prayer box!! It wasn't necessary to put all this effort in such a little thing, but I was pleased that I had! By the end of our successful morning meeting the contents were removed, to be handed of to the right person, and my beautiful little prayer box remained my happy little memory of the morning. This wasn't a difficult project for me, but it certainly was a rewarding one. I remember thinking at the time, that it may have made God smile! Or laugh! I hope you enjoy it, too!! As always, Many Blessings for a wonderful weekend! 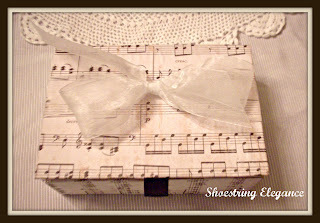 What a beautiful box and such a wonderful idea! It is a lovely box. Great idea! Thank you so much for linking this up to Rustic Restorations Weekend! Thanks so much Tammy and Carol!! you are both so kind to me!! Oh, Pam you are so good to me!! Thank you so much for taking the time to comment, I'm glad you like it!! I'm rather fond of this one, too, it's close to my heart! And it's so nice to know it served the Lord and stays to bless you further! Thank you, so much, Trish!! I'm so glad you liked it, and Thank you for the comment, this seems to be the least favorite project I've shared. But, I too, am proud that it was used to serve the Lord! 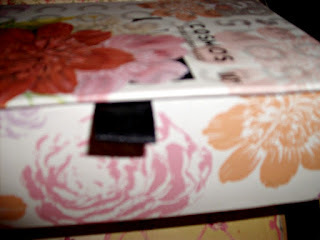 This box is very beautiful and so is what you are doing! 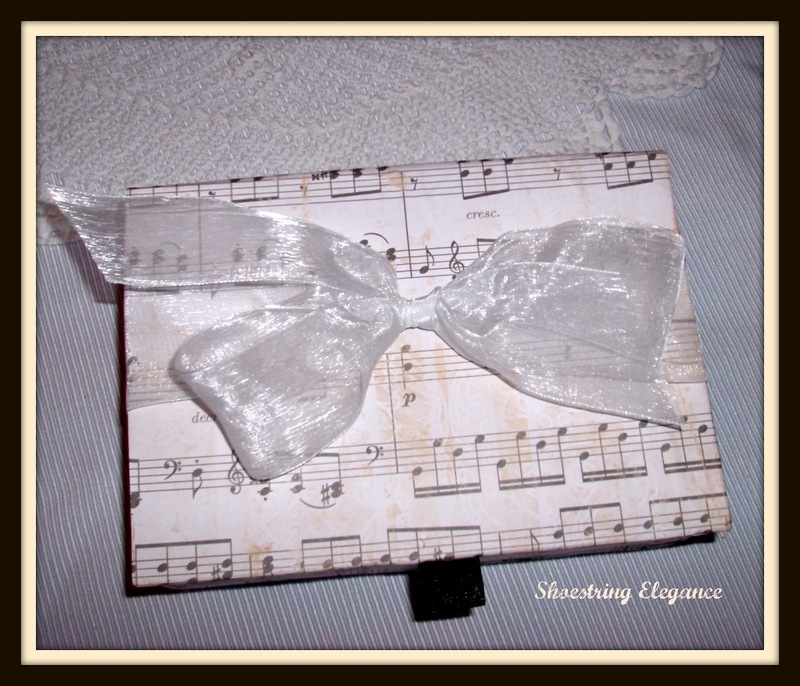 It would be beautiful as a gift box or keepsake too but I love your purpose for it. I too love coffee and cake or whatever as long as it is in the company of good women or friends. You are right! It turned out so cute and can be used for a number of things. God smiled on your use of your talent I am sure :) Thank you for sharing it with us at The "Sunday Stop". Such a sweet story and a wonderful ending:) I love the box and thank you for sharing at Freedom Fridays. Thanks so much, Evelyn! I'm so glad you liked it!! Hello...it's nice to meet you. I came by way of Karen's blog for the Where Bloggers Create party. Feel free to visit with me, if you'd like to see my home studio space....have a great Sunday night. Linda, Thank you Very Much...I think this is the most beautiful comment I have ever received..Thank you so much! I've joined your journey, as well! 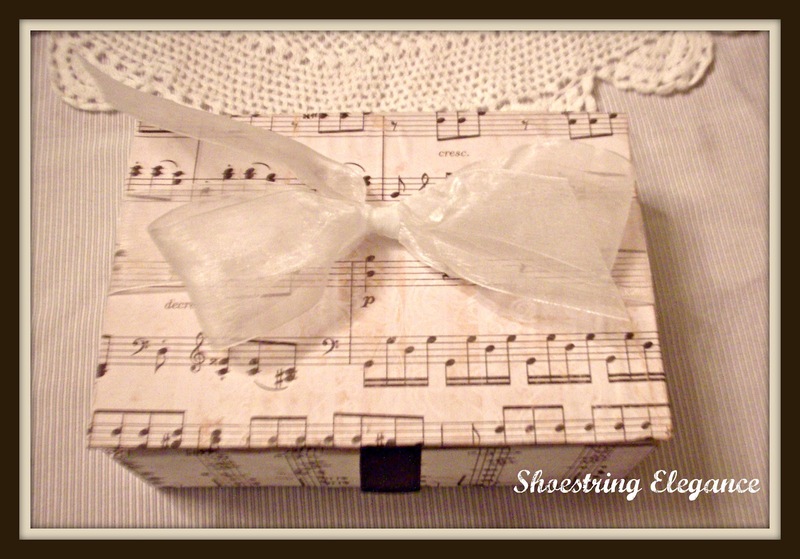 I have no doubt that this pretty little box made God smile. I like that idea of a prayer box. I may have to suggest that at our (super small) church. Thanks you so much, Toqua!! I hope you do make one for your church! As much as we share and ask for prayer, there are still some things and people who find it a weakness, this gives them an "anonymous" way to ask for prayer! Many Blessings to you, too! Where is the tables cape??? comments! They are very much appreciated! Blessings to you both, Theresa. I came to your blog through Karens "where bloggers create link. I love your prayer box. What an inspiring story. Thank you for sharing. Your prayer box is so pretty, and love the paper inside. You are right you could use it for many different reasons. Your prayer group sounds wonderful! So glad you shared your creative inspiration with Sunday's Best! Thank you so much, Cathy!! I'm so glad you liked it! It was alot of fun for me, and now I get to have it my home. I'm thinking win/win! This is a wonderful idea and your prayer box is lovely! Thank you for sharing at TTF last week! I hope to see you join us again! Thanks for the invite, Debi!! All linked up! with your Home and Garden Party again! Thanks for your support! Great idea. Thanks for sharing at the All Star Block Party. Hey, Heather! Sorry it took me so long to respond, I've been a bit behind..:) I'm so glad you're going to make one of your own!! I'd love to see it. I wish I could join you for Christmas in July, but unfortunately I haven't anything prepared and I have 3 other project in the works, but I'll be ready next year!! Thanks for coming to my blog, it's a great honor. What a beautiful little box. Thanks so much for sharing on Tout It! Hope to see you again. Hey J and D! Thanks so much for your comments and for posting my little projects on your Blog, very much appreciated! !